In this, his second book on Greece, William Abranowicz presents the viewer with a collection of color photographs taken over many years and many visits, spanning from 1992 to 2007, and creates a sentimental visual tribute to this country of his heart, for which his affection shows on every page. Despite this somewhat inauspicious beginning, I found myself enjoying the images immensely. The 100 color plates are large and sumptuous, presented as full-size images on the pages with no accompanying or identifying text, sometimes shown alone and and sometimes paired. I received the impression of being guided through the book at an organic but deliberate pace; kind of like floating in the ocean while moving inexorably towards the shore. Tantalizingly, in the list of plates, Abranowicz continues to hold back information, identifying the images solely by location and date. The book seems not to be organized with any concrete narrative, but more as an intuitive progression of images that juxtapose a more traditional, stereotypical depiction with modern contradictions. Like any modern country living cheek to jowl with the relics of its cultural heritage (and often eclipsed by them), Greece seems to exist today at an extremely complex crossroads of time and culture. The landscapes and ruined buildings in many of the photos are, to be sure, beautiful and seductive, but the images most appealing to me seem to be when Abranowicz lets go and indulges in whimsy or playfulness, deliberately subverting more classical tropes. 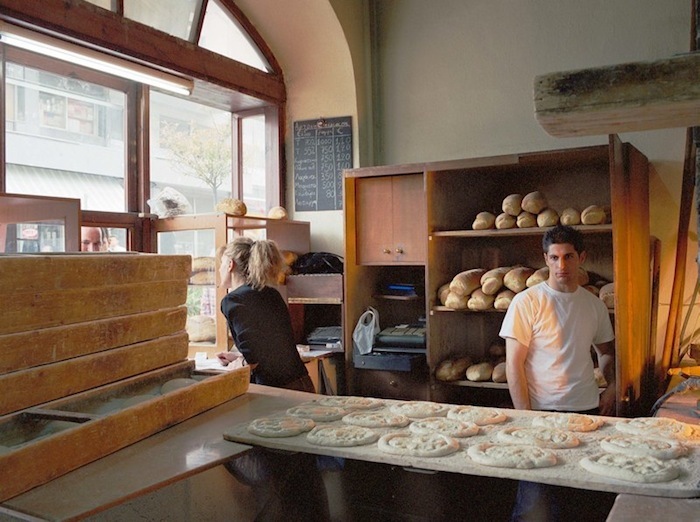 An image of the interior of a bakery is one of my favorites; we see the back of the blond counter girl learning out the window to speak to a customer while the baker in the rear is the focus of the image, gorgeously illuminated by, one fancies, the golden glow of the oven. With his dark hair and eyes and an impossibly Grecian profile, he strikes the traditional contrapposto stance of a marble statue. In another instance, two striking profiles face each other across opposite pages, like dual portraits of philosophers, but one is the head of a goat staring impassively at a mustachioed gentleman wearing an undershirt. A subsequent pairing of images from, respectively, Mykonos, 2001 and Milos, 2007, play lightly with the grotesque. The decomposing head of a sheep, its crooked fence of lower teeth in the foreground, and the rotting, rusting hull of a ship on a rocky coastline, run aground years before, form a sublime diptych. Yet another combination joins the startling greens and blues of the interiors of two different cafes on two different islands, both somehow painted in the exact same hues, but with one watched over by a sticker of a pin-up girl affixed to a mirror. This is a book to enjoy; indeed, to indulge the role of the armchair traveler and to leaf through on cold, grey winter evenings when the lure of a faraway land seems particularly enticing. Sometimes it’s enough to look at some lovely and evocative pictures of a place and want to go there.